Velvet sham has cotton/rayon front. Velvet sham finished with cording and tassels. Cotton. 26"Sq. Dry clean. Made in the USA of imported materials. Cotton/rayon velvet with gimp trim. Polyester backing. 25"Sq. Dry clean. Made in the USA of imported materials. Ivory silk organza sham is stitched with shards of deep blush. Cotton sateen back. 26"Sq. Dry clean. Imported. Cityscape-inspired, raised geometric texture. Rayon/polyester front. 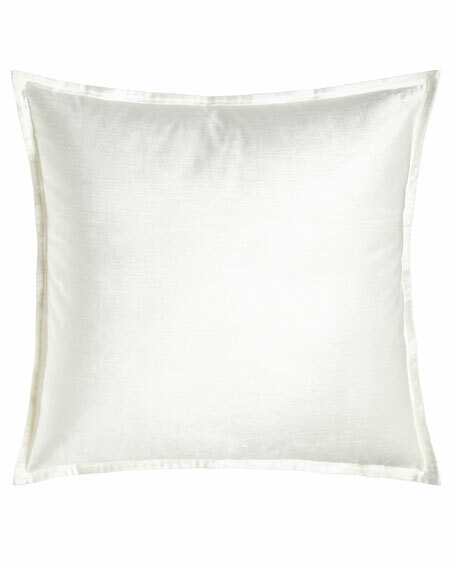 300-thread-count cotton sateen back. 26"Sq. Machine wash. Imported.